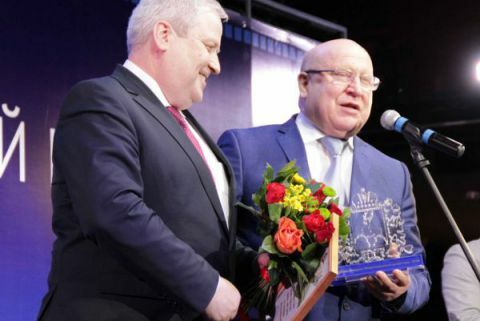 RusVinyl became a winner of the “Investment project of the Year – 2014”, a governmental competition of the Nizhny Novgorod region, in the special nomination of “Inauguration of the Year”. The results of the competition were announced on March 19, 2015 during the solemn ceremony of award, which took place in the Premio Concert Hall. The event was opened by the Governor of the Nizhny Novgorod region Mr.Valery Shantsev; in his welcome speech he highlighted that one of the key tasks of the regional government is creation of a favorable investment climate. The Regional Governor personally presented to the CEO of RusVinyl Guenther Nadolny the award and diploma of the competition winner, and emphasized the importance of the investment project implemented. There were around 30 projects to take part in the competition subdivided into 10 nominations. In particular, the winning projects refer to industrial production, machinery production, services sphere, agribusiness and real estate sphere. Kstovo municipal district was announced to be the “Most Investment-Hospitable district” in the region. Moreover, for the first time in the 9-years history of the Competition the nomination “Investment project of the Year in the sphere of Import Substitution” was introduces, the winner of this nomination became a Nizhny Novgorod factory of Vlieseline wallpaper production - Loymina.